Bizarro returns to his maker, Lex Luthor, in an effort to have his dead friend, Trickster, restored to life. Luthor is beside himself, knowing that Regime Superman will trace Bizarro to him, and sends Bizarro to the Fortress of Solitude. 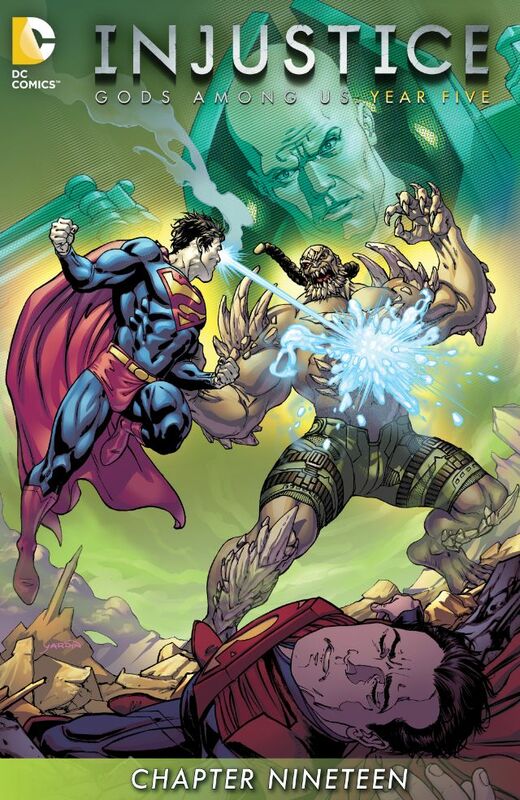 He then sends Doomsday, who is under Luthor's control to dispatch Bizarro, and the battle ensues. Story - 4: Movement. Actual storytelling. Pacing, and what is more, the desire to see the resolution of what's occurred this issue. Injustice, while lacking in most ways, makes good use of the serial format and returns to that form, finally, with this issue. Luthor, also, returns to form in this issue, as the despicable villain he's most recognizable. In sending Bizarro to the Fortress, he's signed his death warrant, for surely Doomsday or Regime, inadvertently, will kill him. A three-way match-up between Regime, Bizarro, and Doomsday is intriguing, and not a brawl to missed, if you're a proponent of such things. The only drawback to the coming fight is that the outcome is clear. If the cover of the issue doesn't give it away, then any knowledge of the video game Injustice is based on does. Occasionally, this series surpasses the morass it willingly sloughs through, and one will just have to wait to see such an occasion is upon us once more. Art - 3: It's always a readjustment after Derenick leaves, but Miller's work, as always is competent, if a wee bland for the scenes it needs to serve up. Cover Art - 3: A good cover entices; it doesn't give the plot away.